Miyajidake shrine located in Fukutsu city, Fukuoka became famous nationwide for the TV commercial of JAL’s “Hikari-no-Michi” (光の道; Road of light). Though, the best thing about this shrine is not with that alone. 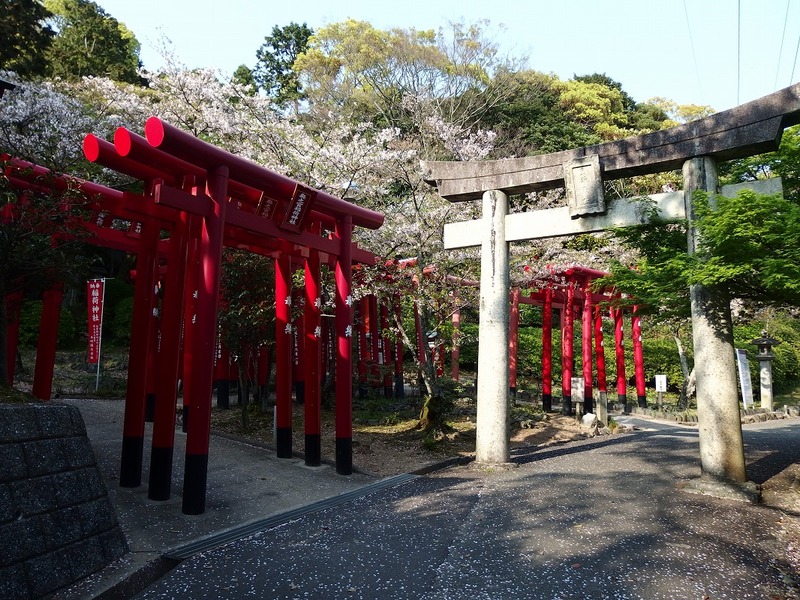 This time I am going to introduce Miyajidake shrine visited in April 2017. The foundation of Miyajidake shrine is about 1,700 years ago. There are three deities enshrined at this shrine. Okinagatarashihime-no-mikoto 息長足比売命 (A.K.A Jingu-kogo; 神功皇后) as main deity, Katsumura-no-Okami 勝村大神, and Katsuyori-no-Okami 勝頼大神 are enshrined together. It is known as the shrine of luck and business prosperity, and more than 2.2 million worshippers visit every year. 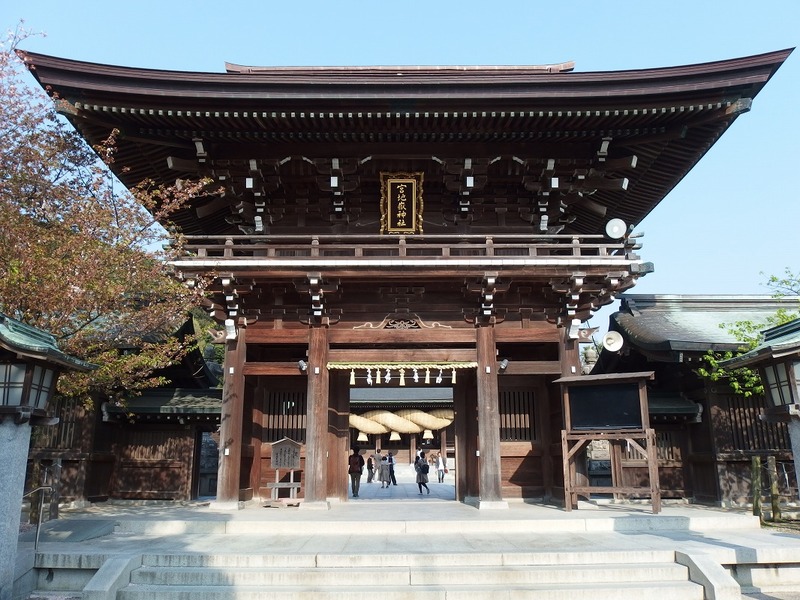 There is an ancient tomb excavated about 300 years ago behind the main hall of the shrine. The tomb itself is presumed to be built around the end of the 6th century. Various excavated items have been found from this ancient tomb, and about 20 are designated as national treasures. An oversized sword, a horse gear, a crown and the like which decorated gold were found in the excavated items. Miyajidake shrine has the “Three of Japan’s best”. 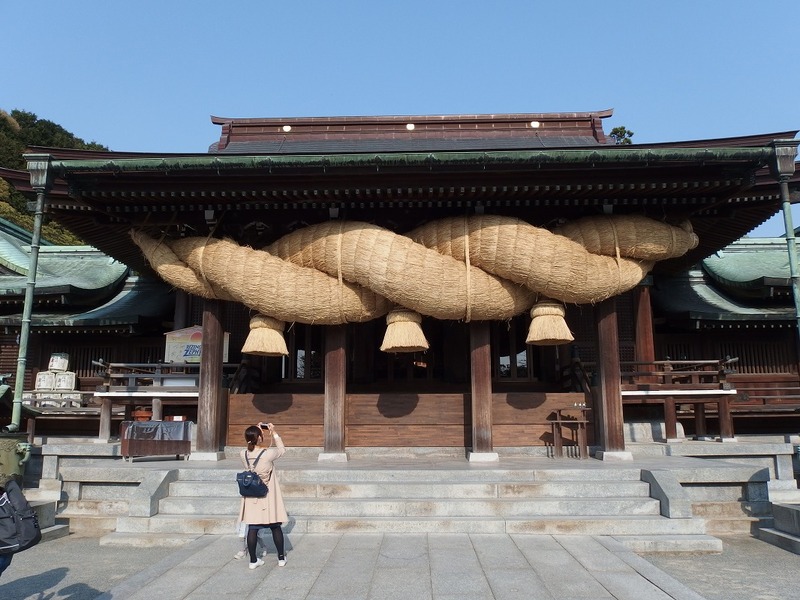 The first one is the large sacred straw rope of 11 meters in length and 3 tons in weight which is also a symbol of the Miyajidake shrine. This sacred straw rope is replaced with a new one every year with help of 1500 people. The second is a large drum with a diameter of 2.2 meters. It is used at midnight on January 1 every year. And the third one is a large bell of 450 kg. It was placed in the worship hall along with the large sacred rope until 1960, but now it is kept in a small hall. 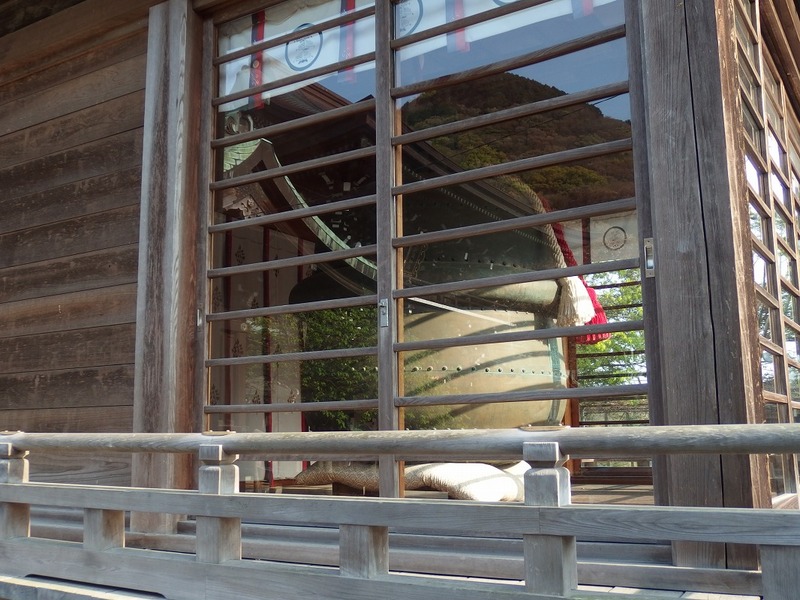 There are also eight shrines called “Okunomiya-Hassha (奥宮八社)” enshrined in the Miyajidake shrine. There is faith that “a great desire will come true if you visit all of eight shrines”, and many people are visiting. After visited Okunomiya-hassha, I found a beautiful scenery. 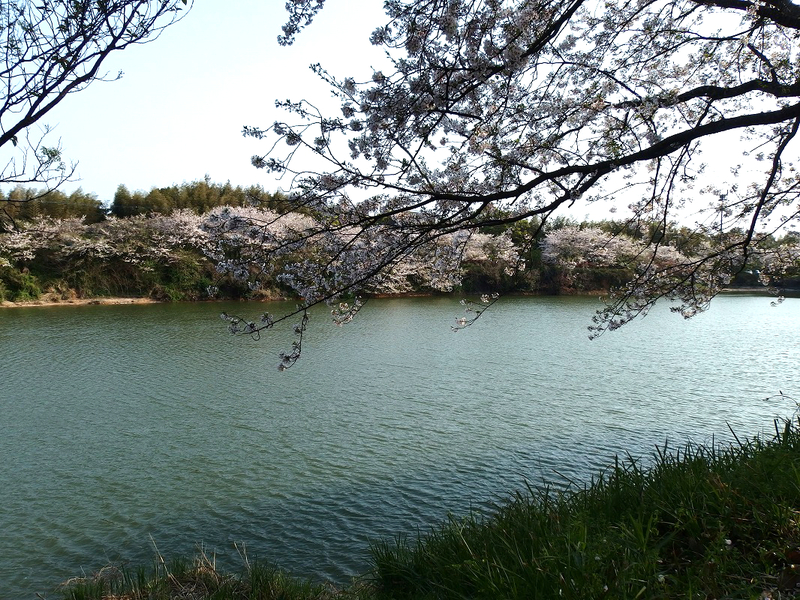 This place is called “Minkamura-shizenkoen (民家村自然公苑)”. It is located just next to Miyajidake shrine, so you can visit here just walk through the Okunomiya-hassha. 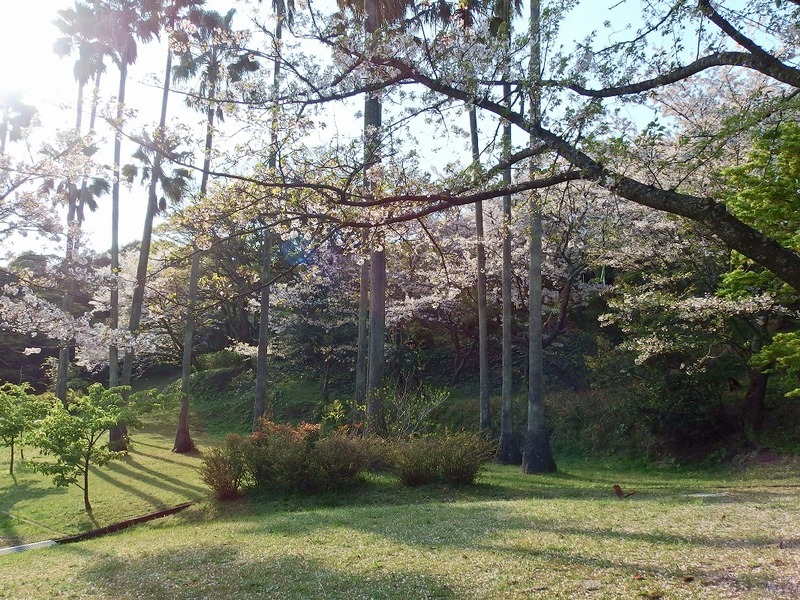 There are some of “Kominka (古民家)” in this park which restored from nationwide. 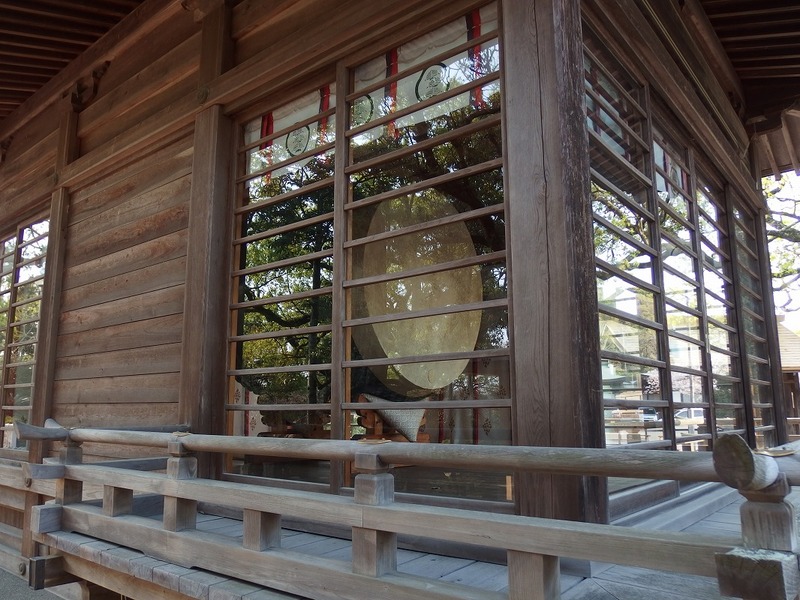 (Kominka is a house built in traditional Japanese architecture.) 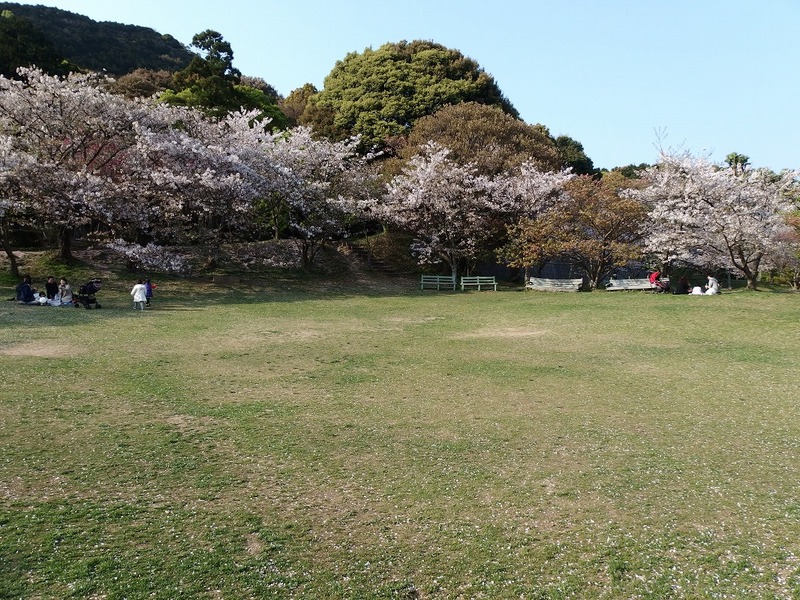 We can see flowers blooming every season, and it is a pleasant place just to walk around. And the last one to introduce is the road of light. 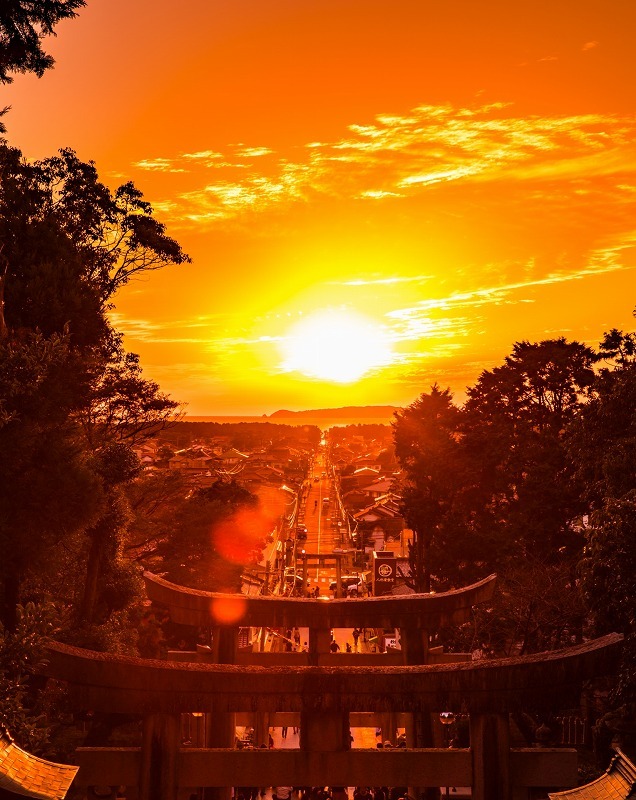 There is a straight road from the approach of the shrine to the sea, and the sunset falls just onto this straight road only two times a year in February and October, then the road of light shows up. You can see a beautiful sight of the straight light path from the shrine to Aino island in the sea. In the shrine, the sunset festival is held during the sunset best time. 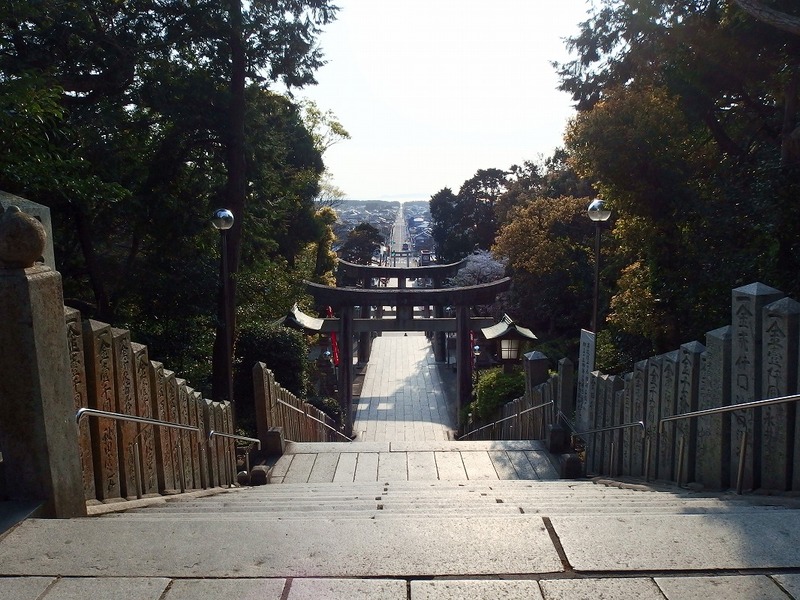 Also, since many people are visiting after the TV commercial, please be aware that certain entrance restrictions may be made regarding entering the stairs of the shrine. Please check the Facebook page of the shrine as I think there will be a notice in advance. Opening hours of shrine office: 7 am – 7 pm. Take a JR Kagoshima main line (鹿児島本線) and get off at Fukuma station (福間駅). Take a Nishitetsu bus No 5 or 1-2 and get off at Miyajidake-jinjyamae (宮地嶽神社前). It takes about 5 min from Fukuma station. ← Oita Yufuin Trip Part.2: Visiting Tourist Attractions Of Yufuin. Extra Topic: Jigoku-Meguri In Beppu.